If you are like me, most of your recipes come in the form of ripped out magazine pages, print-outs from Food Network’s website, or just straight from your tablet/laptop screen from a bookmarked webpage. I hate to admit it, but the concept of handwritten recipe cards is a relic of kitchens past. My mom is the keeper of all things recipe card…and has collected them from both my grandmothers, as well as her friends, colleagues, and neighbors. With personalized handwriting, kitschy designs, and stained from cooking attempts- sometimes successful, sometimes not- each recipe card is sentimental in its own way. I wanted to do something to spotlight heirloom recipe cards. 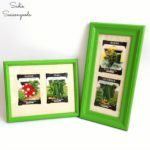 And since I absolutely adore old kitchen gadgets, why not combine the two by creating a recipe holder from upcycled kitchen tools This post contains affiliate links for your crafting convenience. Another bonus about this project? I can use up some of my vintage clothespins! Over the years, I’ve acquired a few…and while I’ve used them in other projects before, I still have WAY TOO MANY! Time to use some of these up! And no worries if you don’t have any older clothespins…the design hasn’t changed much over the years! Anyway, back to the project. These are SUPER easy to make and truly something anyone can do. Gather some vintage kitchen tools that stand on their own (like a masher, meat hammer, or similar), your clothespins, and a hot glue gun. Items assembled and ready to make (and then bake)! So, here’s the one and only step of this craft: Using hot glue, attach the clothespin upside-down on the handles of your vintage kitchen tools, so that the clippy part is facing up. Since hot glue hardens almost immediately, you’re done! Now just clip in your recipe card and voila- a recipe holder from upcycled vintage kitchen tools! Functional AND cute! 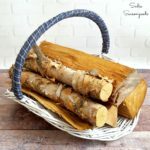 Vintage kitchen tools are SO common at antique malls, and clothespins are easy to come by- so you’ll be able to make your own recipe holder from upcycled vintage kitchen tools in no time! Baking or cooking something familiar from a card written by a loved one’s hand is wonderfully nostalgic and sentimental. Do you write out any recipe cards nowadays? I certainly cherish the ones I’ve got. If you love vintage kitchen tools as much as I do, then you might appreciate this blog post I did on creating vintage French Farmhouse kitchen decor using all thrift store finds! 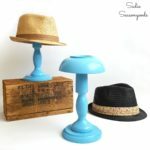 Looking for more upcycled and repurposed projects using vintage items? You can scroll through my entire collection of inspiring ideas here before you go! definitely cute 🙂 there will be a run at the yard sales and thrift stores looking for vintage cooking tools now! Right?! Can’t have too many!!! These are great! Where did you find the vintage gadgets? I’d love to get me some! Thanks, Elise! Just about every antique shop I go to has a few booths with great vintage kitchen gadgets. I just love them!!! This is a really brilliant project! Of course, not entirely useful for me since I’m usually reading recipes off my phone – don’t even bother printing! Love this. I have had some gorgeous American friends over the years and the thing that they all have in common (apart from being warm, fun people) is that they have given me handwritten recipe cards, now here’s a thought… I could do this! What a neat project! I don’t have a lot of vintage recipes but it would be nice to use one of these to hold those printouts that I have. Love that these can be functional or decorative! I have a box of handwritten recipe cards, from my grandma, that I absolutely cherish. What better way to decorate than with a couple of these? Love.it! Thanks so much for sharing at Inspire Me Wednesday. Featuring you in this week’s issue. Thank you, Heidy! LOVE the Weekend Social link up party! What a clever idea!! I have some vintage cooking tools but have never found a good way to display them, stealing this idea! Thanks for sharing:-) Stopping by from Merry Monday where I will be Guest hosting for the next couple of weeks. This post will be one of my features this week. I love these! What a great way to make a vintage gadget functional again–and of course, beautiful! I’ve got a few of these put away in a storage bin with other decor I just never got around to unpacking. I think I will have to dig them out! Thank you so much for sharing! I will be featuring this post at the Merry Monday Link party tonight at 8 CST! Way to cute for real. I love clipping old recipes from magazines and grocery items….but they tend to take up so much space because, let’s face it, there are a lot! That is a very great idea!!! Thank you for sharing with us at #homematters Linky party. Great craft idea! Your creativity is endless. Thanks for sharing on Friday Favorites. Hope to see you this week. I also pinned your post!